Explore the best river views of Germany, Austria, and Hungary to explore the splendors of Europe’s history and beauty on the Danube. Board you Suite Ship® in Nuremberg and cruise to the German town of Roth. Enjoy guided sightseeing of the Bavarian town’s timbered houses and Schloss Ratibor hunting lodge, built in 1535. Or, take an excursion to tour Nuremberg’s historic sites, including Kaiserburg Castle or the Nuremberg Rally Grounds. Enjoy sightseeing in Regensburg to see the 179 AD entrance to Castra Regina fortress, and a guided walk through the "City of Three Rivers"-Passau-before sailing to the lovely Austrian city of Linz. Cruise to Melk to tour the magnificent Benedictine Abbey or hike the hillsides above the Wachau Valley. On to Vienna, "The City of Music," to explore the historic Habsburg Empire-including the Imperial Palace, Vienna Opera House, and St. Stephen’s Cathedral. 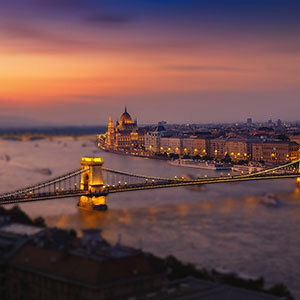 Your Central European river cruise continues to Budapest-the "Pearl of the Danube," with its iconic Heroes Square and spectacular architecture, thermal baths, and vibrant night life. Tour the historic Hungarian towns of Mohács and Pécs, and sail through the remarkable landscapes of the Balkan states of Croatia, Serbia, Bulgaria, and Romania. Visit the most preserved Croatian fortress in Osijek, and attend a performance by young students of the Franjo Kuhac music school. In Serbia, take a guided tour of Belgrade, and visit Lepenski Vir for a guided tour. See ancient archaeological finds and the amazing Danube Gorge before cruising through the narrow Iron Gates Gorge. 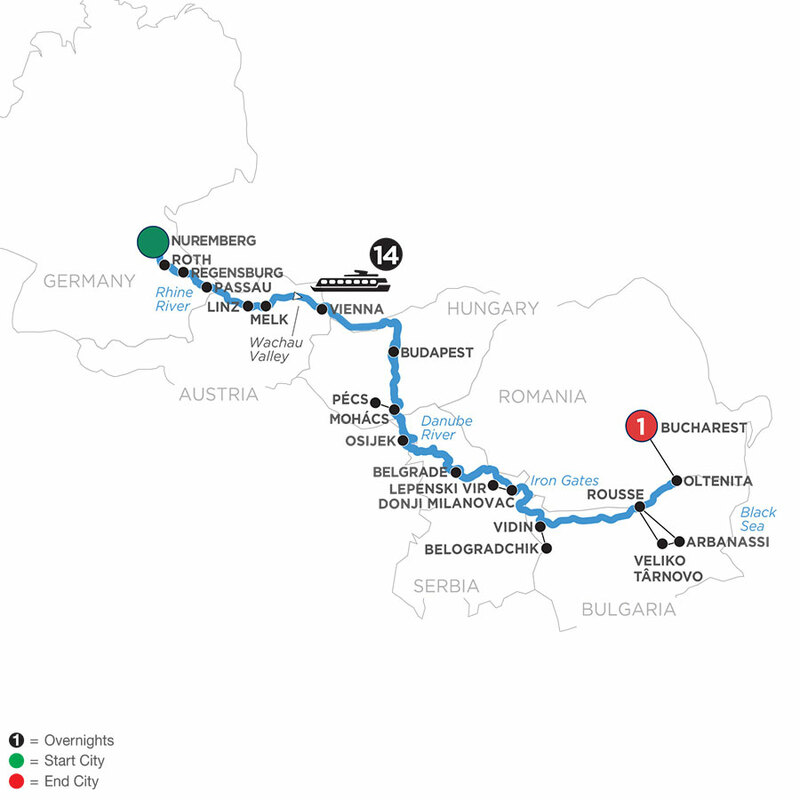 You’ll cruise through Bulgaria with guided sightseeing in Vidin, Rousse, Veliko Trnovo, and Arbanassi. Such marvelous sights include Belogradchik’s remarkable rock formations and Bucharest’s Royal Palace Square. Your Danube River cruise concludes here in Bucharest for an overnight stay in "The Paris of the East."